Over the traffic and noise at a Sri Lankan market, you’ll likely hear the clanking of metal on metal and know kottu isn’t far away. 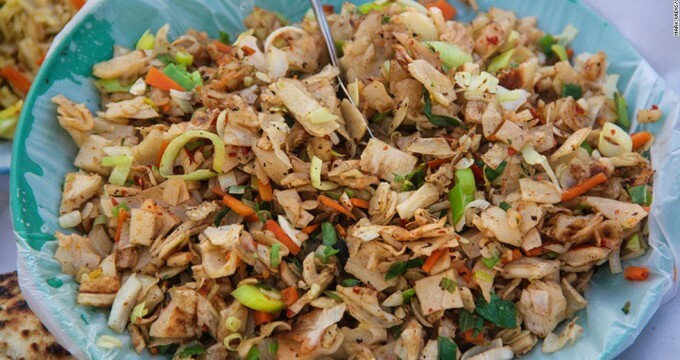 Kottu is Sri Lanka’s hamburger – everybody’s favorite go-to fast food when craving something tasty and greasy. It resembles fried rice, except instead of rice, it’s made with a type of roti known as godamba roti (a flat, crispy bread). The roti is normally fried at the beginning of the day, piled into stacks and served as it’s ordered. When you place an order, the kottu chef will fry and chop the roti with a selection of ingredients you choose. The result is a tasty mixture of salty pieces of fried dough, lightly spiced and extremely comforting. Kottu is served with spicy curry sauce, which you can either use as a dip or pour over your entire plate.